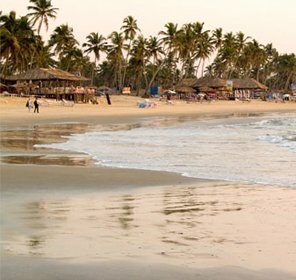 Folded up by azure water of Arabian Sea and with hills in the background, Anjuna Beach in Goa is a perfect paradise for beach lovers. 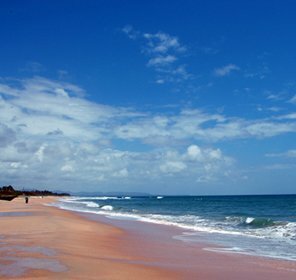 Situated just 8 km away in the west of Mapusa town, this beach is blessed with a bizarre array of red laterite rocks. It is beautifully embellished with picturesque sceneries and so the place is reckoned among the hottest tourist destination of India. 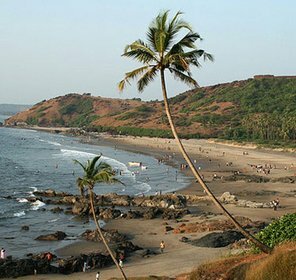 Further, its credible palms and rocky crescent give great pleasure to be at Anjuna Beach. It's distinguished due to the formation of unusual rock placed on a small inlet of white sand and black rock protruding into the sea. It's a complete package of tourist attractions that has a wide range of activities to offer. 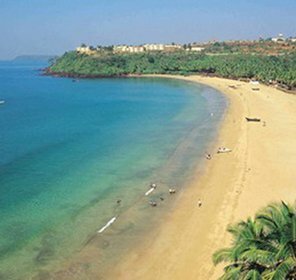 Chock-a-blocks with nature enthusiasts every year, the beach which always beckoned the tourist most is none other than Anjuna Beach tour. Anjuna beach Goa is an ideal choice for nature buffs, who love to enjoy full moon parties during the New Year and Christmas. Visitors on this very day rejuvenate themselves in a pleasurable atmosphere of the lucent full-moon casting a magic charm and the soft frothing waves snuggling their feet. So, if you wanna experience the real beauty of landscapes, luxury accommodation, seclusion, nightlife parties, reliable seafood dainties and voguish shopping opportunities, plan for Anjuna Beach Holidays and make it your best ever holiday experience for ages. 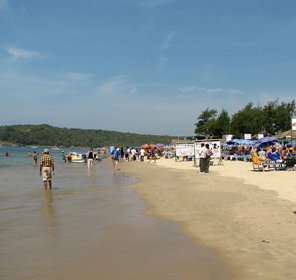 Anjuna Beach in Goa attracts tourist due to its luxury accommodation option with first class facilities. 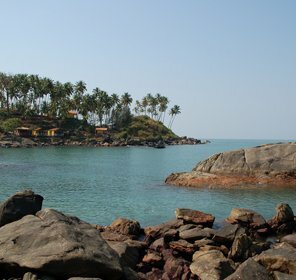 There are many guesthouses, luxury hotels, and beach resorts around the Anjuna. The prices of all hotels and resorts varies from budget to luxury ones. You can choose from a large number of accommodations and enjoy your holiday trip with ease. 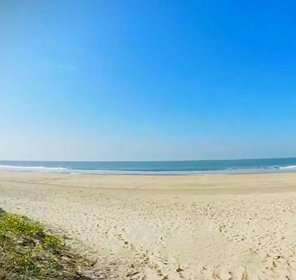 If you love to rollick in the sea and starve for a bath in the sea waters, Anjuna beach in Goa would be your perfect place for vacationing. There are some interesting activities and water sports which are extremely admired by adventure lovers. If you're adventure freaks and wanna experience defying activities, Anjuna beach is not going to disappoint you in any way. 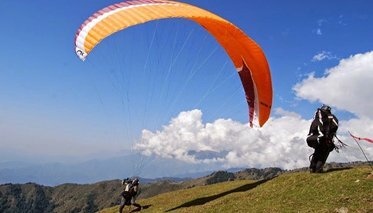 All kinds of sports like wind surfing, scuba diving, parasailing, paragliding are available to add extra fun while holidaying. 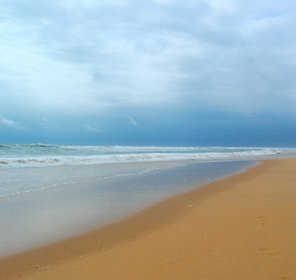 You'll get various ranges of adventure sports that are mostly enjoyed at the beguiling Goa shoreline. Anjuna captivates large number of visitors due to its scenic beauty and picturesque view. You can hang around nearest attractions and explore the natural beauty of the splendid Albuquerque Mansion (1920), lined by octagonal towers and appealing the Mascarenhas Mansion, the Mangalore tile-roof, the Chapora Fort, etc. 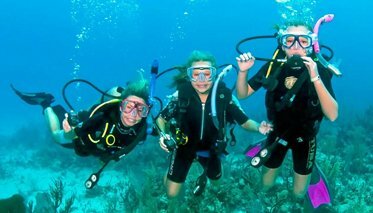 You can also indulge yourself with other activities like shopping, photography, snorkeling, and bungee jumping. 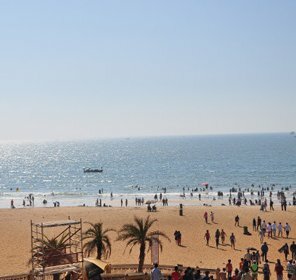 If you're with your family or friends, you must have tiptoe in gleaming of Arabian Sea. Other than this, swimming and sunbathing will give you an unforgettable experience of a lifetime. One of the most magnificent mansions in Anjuna that represents the gilded lifestyle of its formal owners is Albuquerque Mansion. 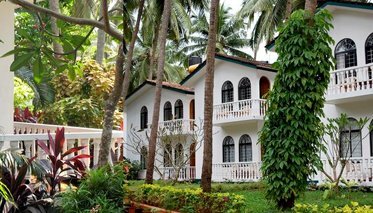 For the tourists, the mansion is one of the sight-seeing highlights of Anjuna Beach that is bedighted with appealing Mangalore tile â€" roof and octangular tower. Located at the vicinage of Anjuna Beach, Chapora Fort offers a beautiful picturesque view of Anguna and Vagator beaches. 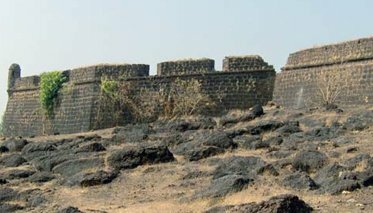 It's a must-visit place where one should go and explore the history hidden behind this fort. 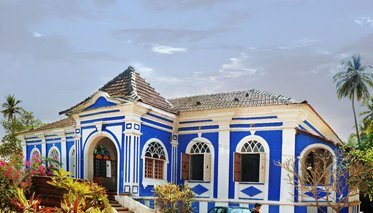 The Mansion is another tourist attraction that's located in Anjuna Beach. The balconies are quite captivating and have stunning stained glass floral engravings. It's an architectural amusement available with rich balconies. This market is located on the way to the beach, which captivates large number of tourists to crowd this place every Wednesday. While going inside the market, you'll get a large variety ranging from imported electric gadgets to other man-made objects. 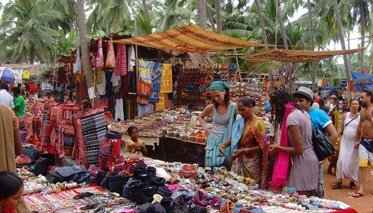 Stuffs like European snacks, Tibetan, Kashmiri, Gujarati trinkets and handicrafts, artificial ornament carvings, cassettes of Goan Trance music, colorful T-shirts, etc. are available for sale in this market. If you are an expert in bargaining things while buying, you will definitely get excellent deals in the market. 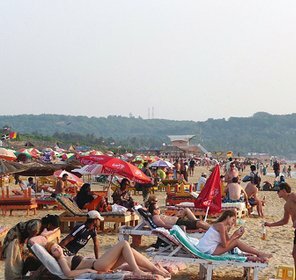 Comparing from all the famous attractions of Anjuna Beach, the only thing that waves and clasp many tourists are the full moon trance parties, which is also popular as Acid House Parties. 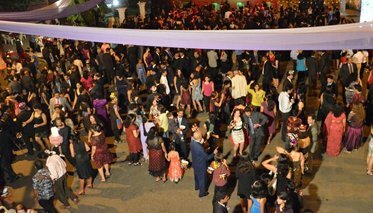 This party is one of the best places for merriment, fun and frolic. Last till the early hours of dawn under the moonlit sky, this place brings lots of fun for locals and foreign tourists as well. Enjoying a drink sitting along the campfires is another memorable experience that is always admired by travelers. 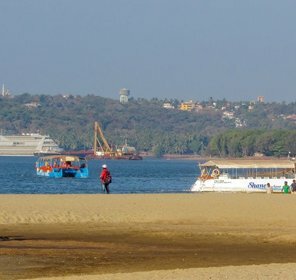 The nearest airport is Dabolin, which is 29km away from Panaji and 47 km from Anjuna. 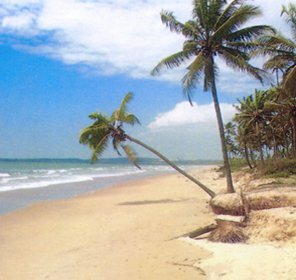 Direct flights to Goa are also available from major cities of India like Delhi, Mumbai, etc. 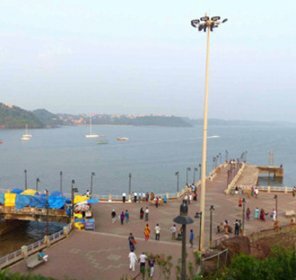 Karmali is the nearest railway station that is 11km away from Panaji and 29 km from Anjuna. Other station is Thivim, situated 19 km from the beach. NH17 is well connected from Panaji and Mapusa. For tourists coming from Mumbai can board the bus from Mapusa to reach Anjuna. November to February is the best time to visit this place. 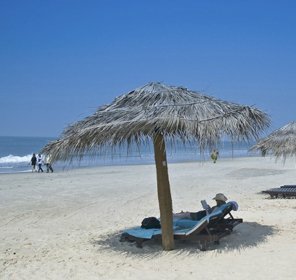 So, if you are looking for the best honeymoon spots or want to take break to the beautiful beaches of Goa, hurry up!!! 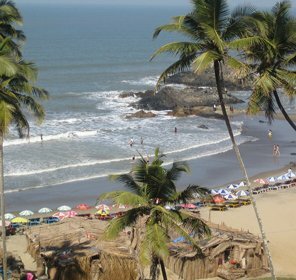 Don't miss the offer as Tour My India brings ultimate deals and packages for Goa destinations, where you can enjoy with your loved ones with ease and that too in the budget.